The monument near Orrin is closest to the actual Geographical Center being only 4.1 miles south of the 48�N / 100�'W position that defines the location for the Geographical Center of North America. This monument is also the most obscure of any center monument since it is located on private property and was never specifically made for public viewing. In 1951, twin brothers Wendelin M. Bickler and Joseph M. Buechler discovered that the position of 48�N / 100�'W was very close to their farm and wanted to promote Orrin as the true Geographical Center location instead of the Rugby location that had been promoted for two decades. 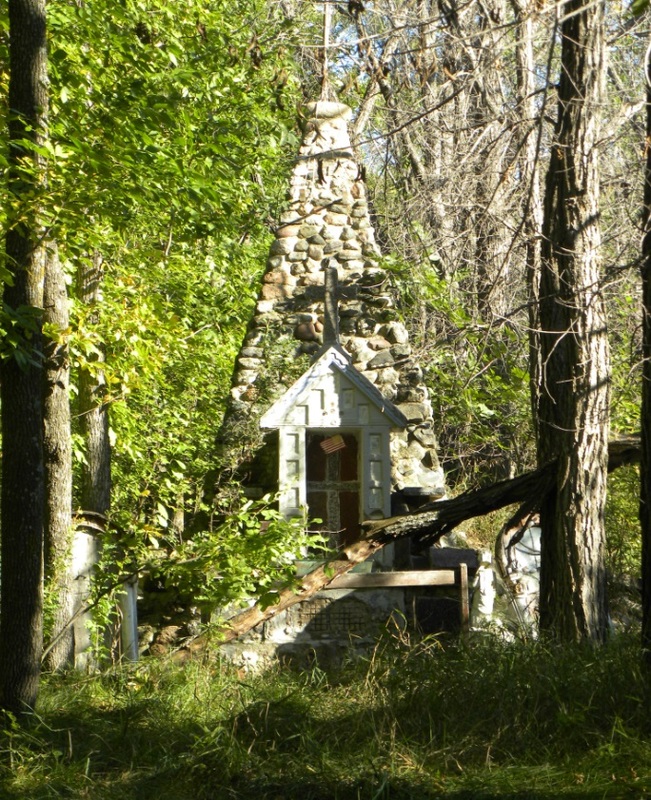 A location was selected in a row of trees for a stone cairn monument. Whether this was a convenient location or if they thought this was the exact location is unknown. 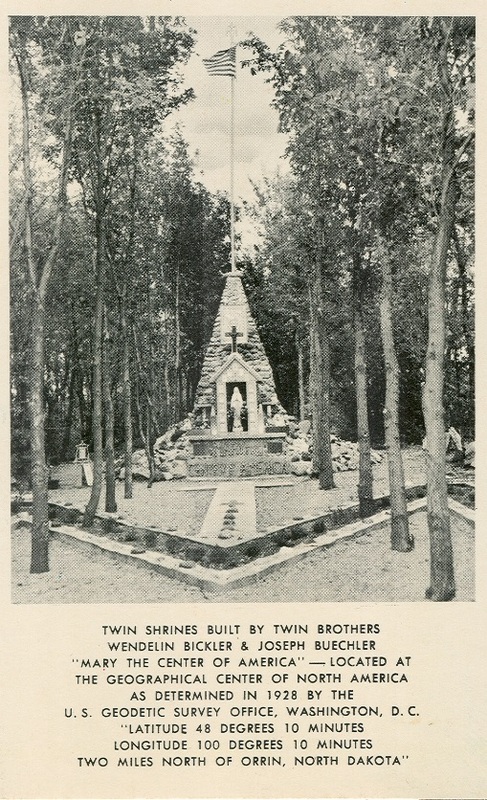 The monument was started when the two men were age 45, and being devout Catholics, the brothers transitioned the monument into one that would also honor the Virgin Mary. 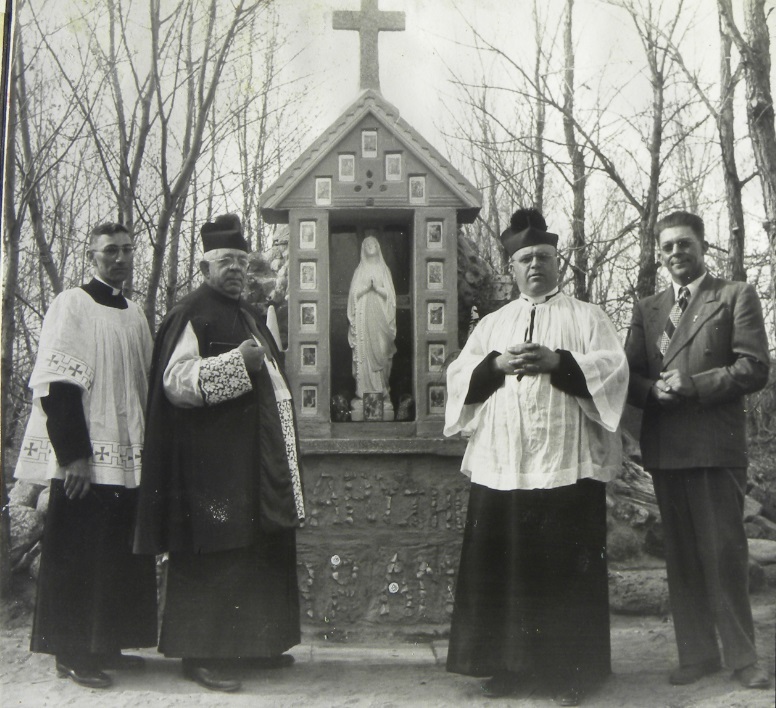 The monument and accompany Shrine to Mary was dedicated on May 16, 1954. 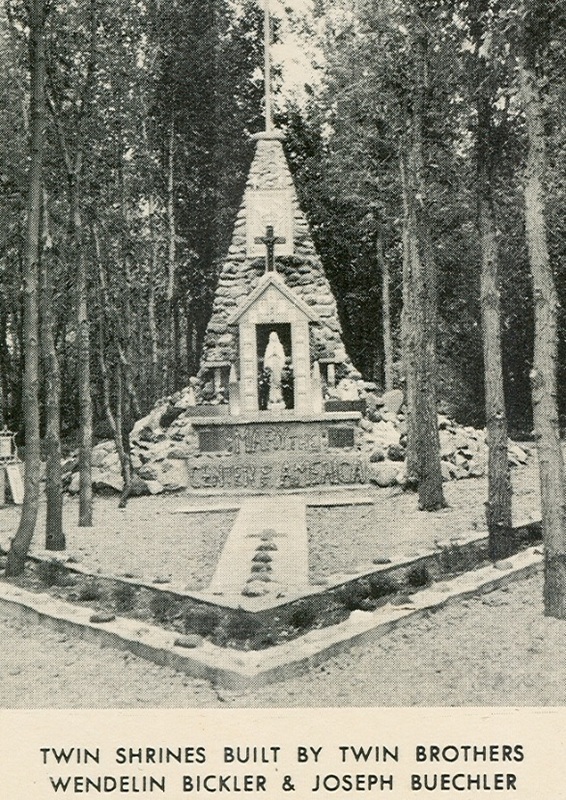 It was named "Mary the Center of America" monument. Since 1954 was also a Marian Year for the Catholic Church, the shrine was held with special reverence and many local religious observances were held at the location. 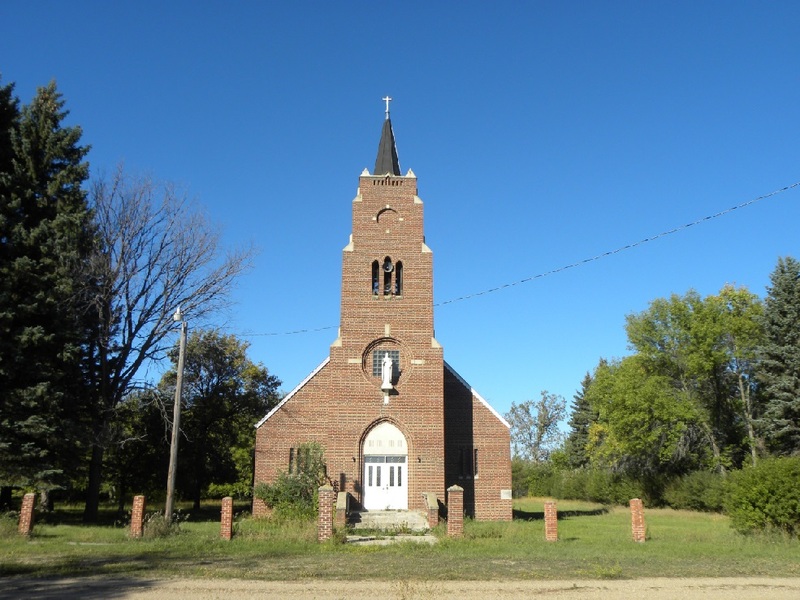 The Catholic Church in Orrin, which is now closed, was once a large congregation. Worshipers would often walk one mile from the church to the shrine and hold outdoor services there. When the Russians launched the first satellite known as Sputnik 1, the Buechler brothers became enthralled in space travel and believed that their monument was also directed connected to the center of the universe. In the back of the stone cairn was a secret compartment that was once said to contain a rock that was recovered from the moon as well as other important artifacts connected with space travel. 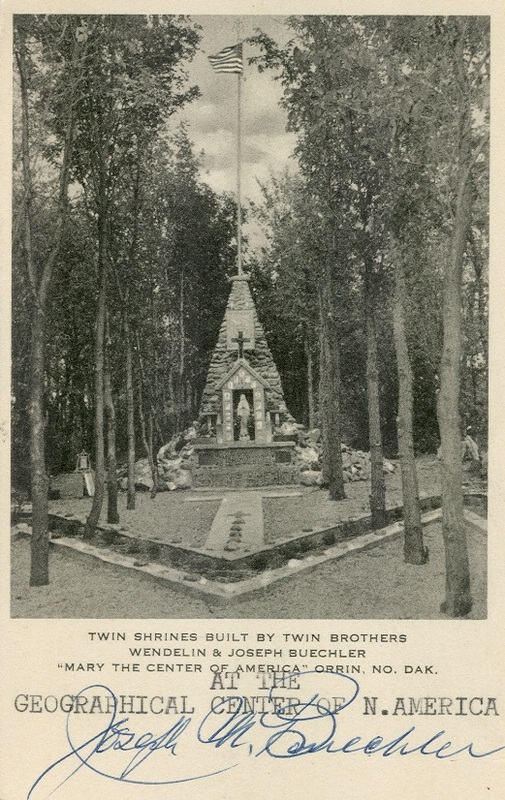 The brothers promoted the monument by sending postcards throughout the country and asking those who received one to send one of their area back to them. Today the shrine is overgrown in trees. 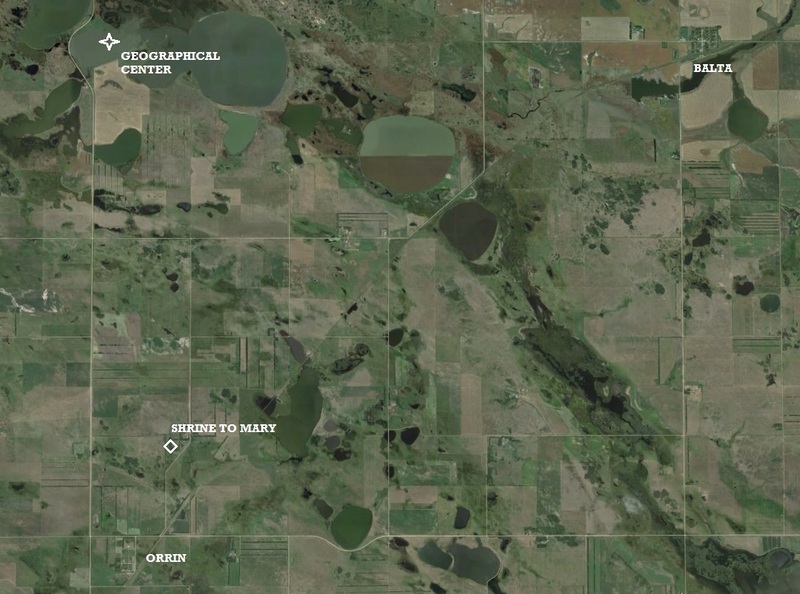 The land has changed ownership and maintaining the site would be a time consuming endeavor. Permision is required from the landowner to see the monument. The stone cairn was solidly built and actually resembles the one at Rugby. If it were not for historical photos, it would be hard to imagine the prominence that this location once held. 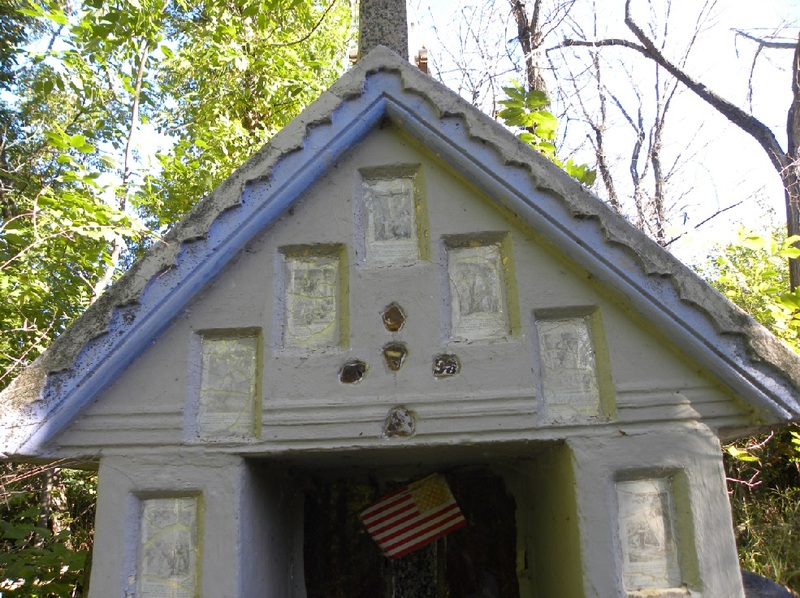 The finished shrine to Mary and stone cairn. 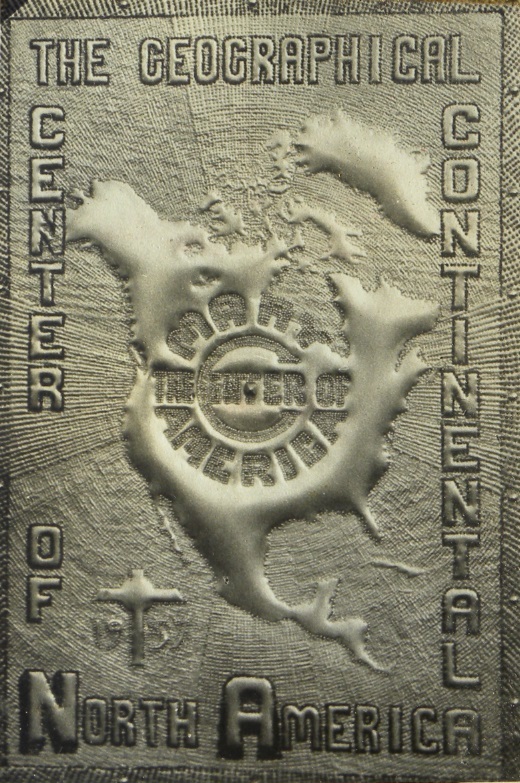 "Mary the Center of America". 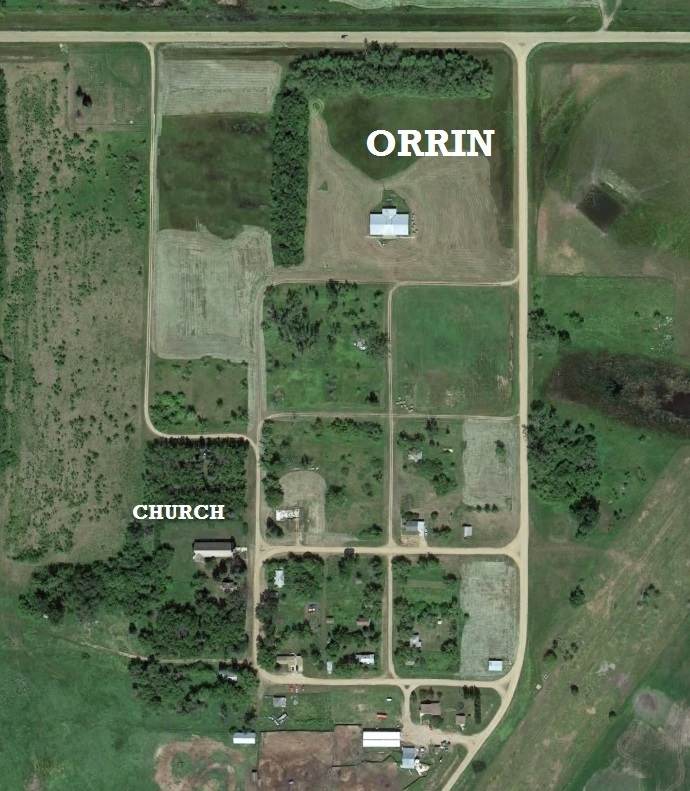 Location of the shrine and stone cairn south of the exact location and the relationship to the town of Orrin. The front of the monument today. 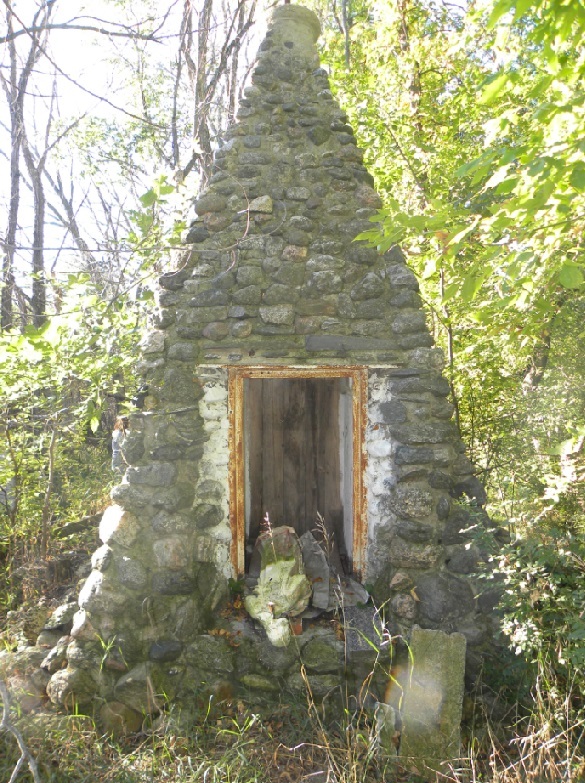 The back of the stone cairn where the door with hidden compartment was located. A portrait of Mary is among the many items still around the shrine. 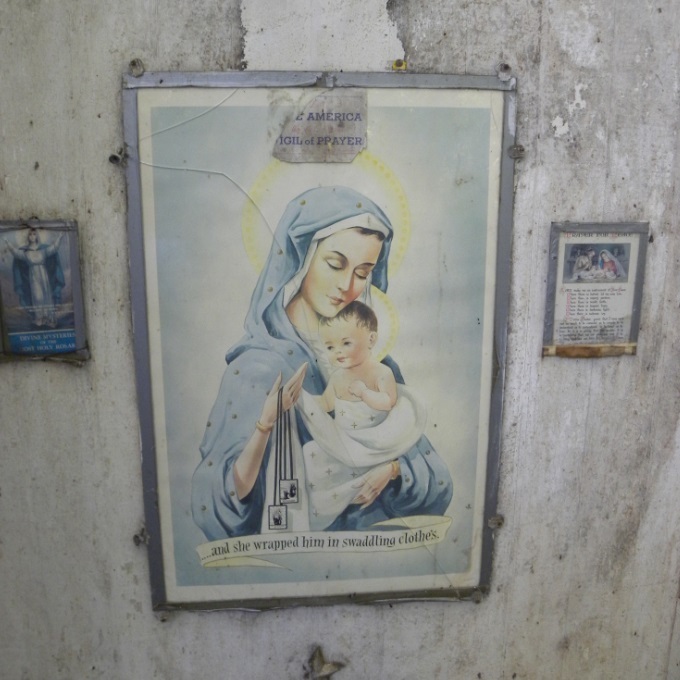 The Shrine to Mary has many photos inlaid into the concrete. 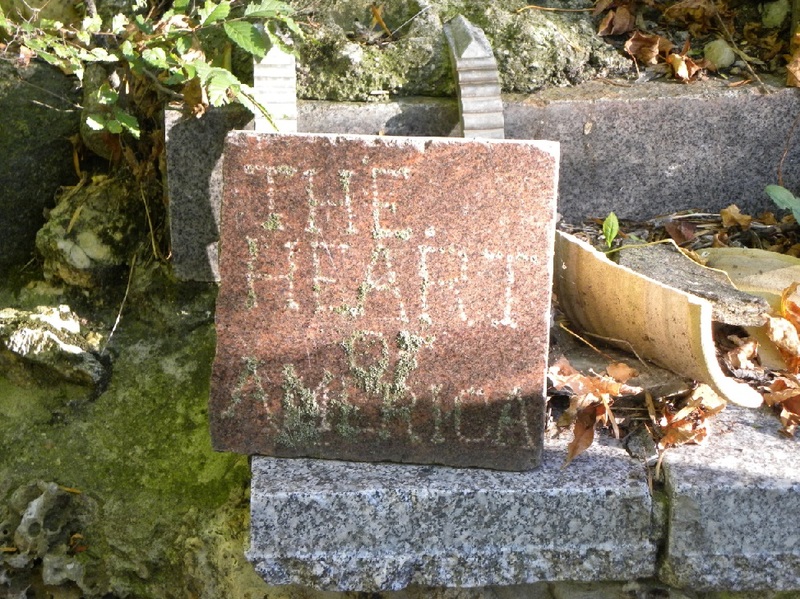 A stone etched with "The Heart of America". 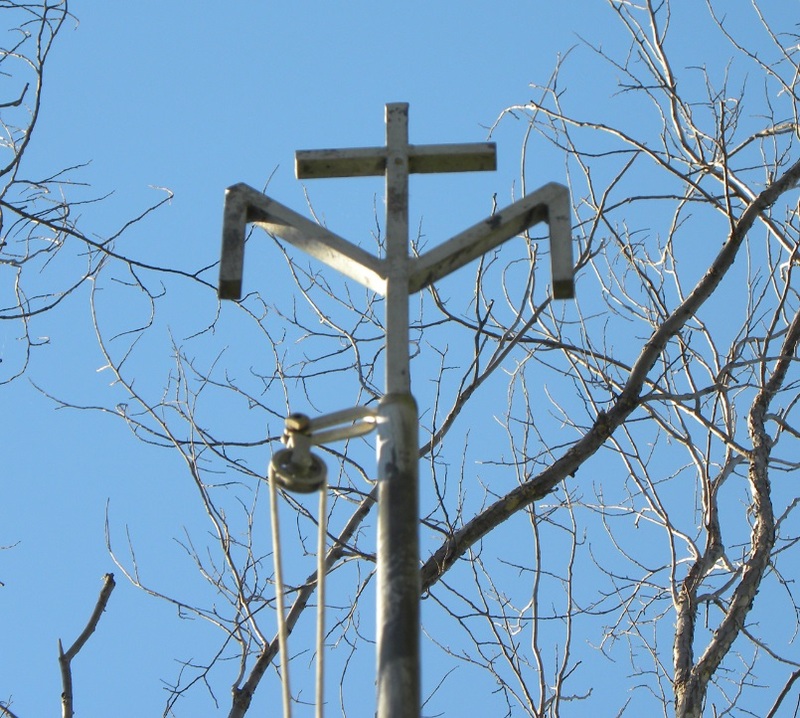 Top of the flag pole on the rock cairn with the letter "M" for Mary. This large handmade aluminum sign once hung from the top of the stone cairn. 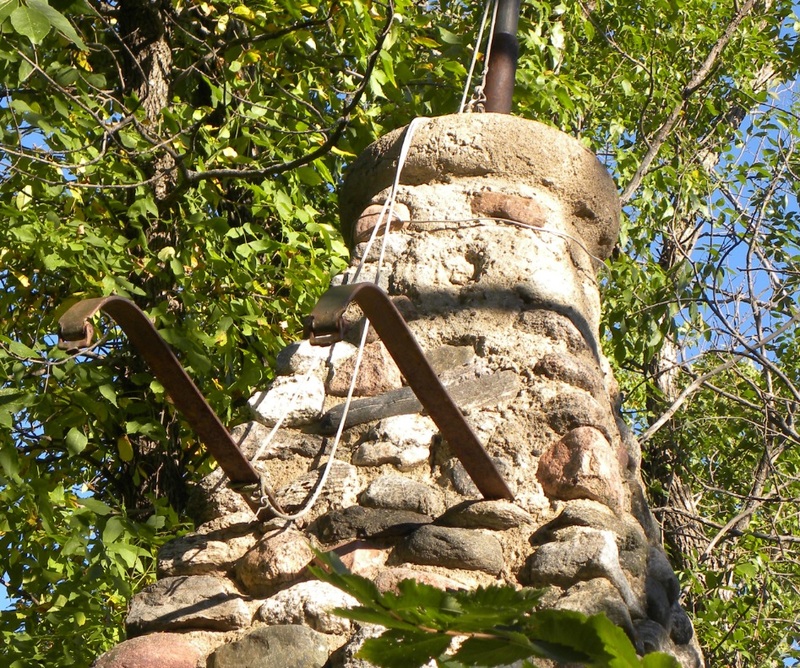 Brackets at the top of the stone cairn hung the aluminum sign shown above. 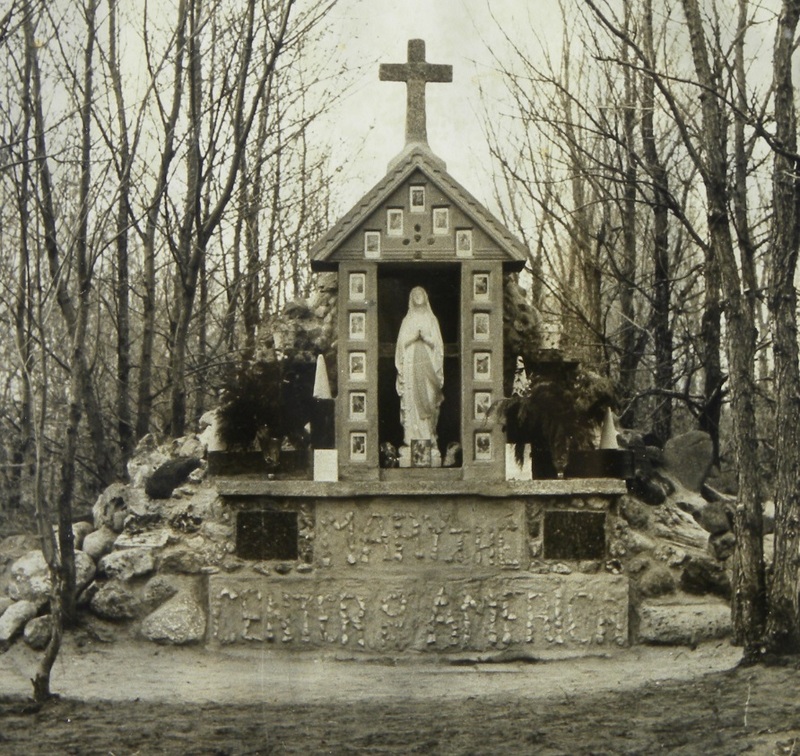 The completed shrine to Mary before the stone cairn behind it was complete. Dedication of the Shrine to Mary. The now vacant Catholic Church at Orrin. Aerial view of what is left of the town today. The two postcards below are the only ones known that were commercially made for the monument near Orrin. 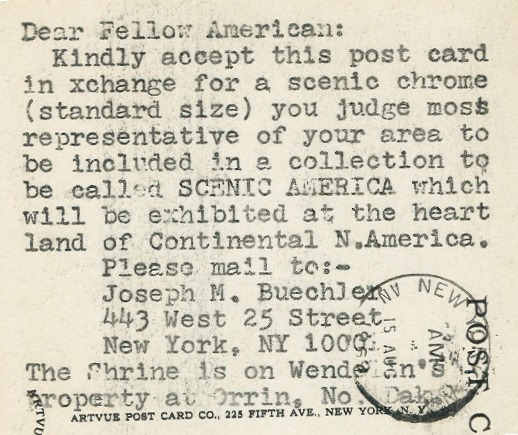 The text also shown below was often on the backside requesting the receiver to send a postcard of their area in return.